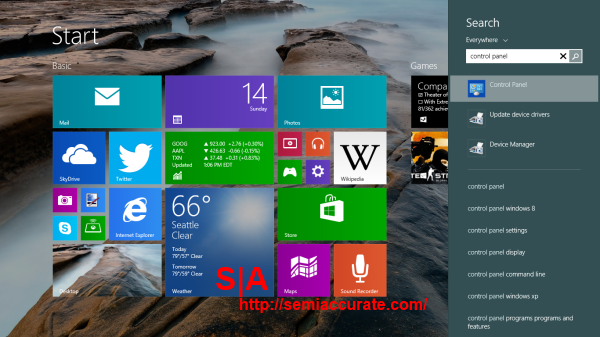 At its annual BUILD conference last month Microsoft unveiled the latest major update to the Windows Operating System. Dubbed Windows 8.1, this update is best thought of as a service pack for Windows 8 which debuted last year to mixed reviews. Arguably Windows 8 wasn’t a finished product when it hit the shelves. With Windows 8.1 Microsoft appears to have spent a lot of time polishing those rough spots. 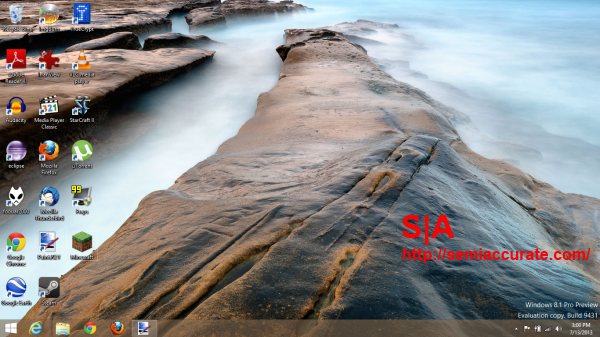 One of the most apparent changes in Windows 8.1 is the ability to use your desktop wallpaper as your start screen background. It’s a simple feature, but it’s one that has been conspicuously missing from Windows 8 until now. 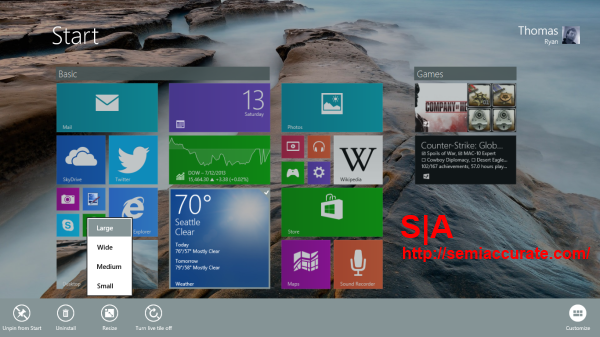 Additionally Microsoft has seen fit to allow users to have a much greater degree of customization when it comes to the color choices on the start screen background. Users still aren’t able to choose what colors individual tiles are, but even this greater degree of start screen customization was sorely needed. Hopefully with future update Microsoft will continue to allow user more control over the appearance of Windows. For many pundits Microsoft’s inclusion of a “Start button” was a big acknowledgement on the company’s part that it had failed to coddle legacy users enough with the Windows 8 desktop environment. To a degree they’re right, but what they’re missing is that the start button takes the user right back to the start screen, rather than bringing up a start menu like construct. I honestly think this is one of the smartest decisions that Microsoft’s made with Windows 8.1. When new users are introduced to Windows now, they’ll be perpetually stuck in a desktop to start button to start screen loop, until they can use trial and error to master Windows 8’s gesture based navigation and control system. Compare this model to the old system where users were basically dumped in the deep end and left on the desktop without any visual cues to help them get back to the start screen. The re-introduction of the start button has given mouse-based users a kind of sandbox area for them to make use of Windows without immediately needing to master the hot corners and gesturing system. Thus Microsoft has significantly reduced the learning curve that the modern Windows environment (read: Metro) introduced. Speaking of the start screen Microsoft has also made a number of improvements to the functional side of this environment in addition to the aesthetic improvements I touched upon earlier. Let’s start with the center piece of the start screen, the tiles themselves. 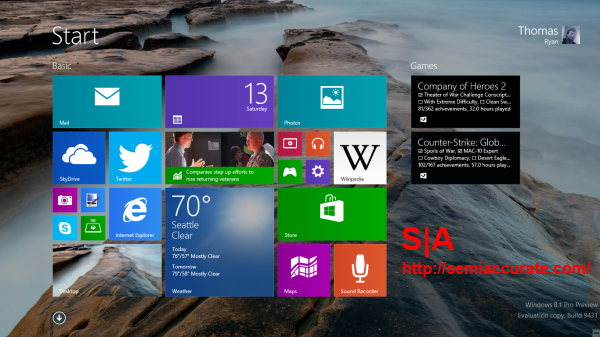 In Windows 8 you were pretty limited in terms of how you could resize a given tile on the start screen. With 8.1 you are still limited, but Microsoft has introduced two new tile sizes, the Huge four by four option, and the small option which is a quarter of the size of the medium option. It difficult to explain in words why this is so important, other than to say that with the small tile size Microsoft has drastically increased the total possible information density on the start screen from 36 medium sized objects to 144 small objects per page on a 1366 by 768 display. The next big improvement to the start screen is the all apps list. By selecting the down arrow in the bottom left corner of the start screen users now have access to a list of most apps installed on your PC. 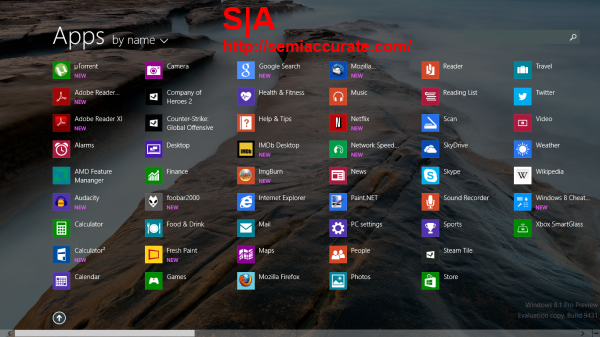 In our testing we noticed that while all Windows Store-based apps appeared in the list not all of our desktop apps did. The all apps list is a great example of the theme behind the Windows 8.1 update: catching up with Windows Phone. As any windows phone user can tell you, since the introduction of Windows Phone 7 users have had access to a similar all-apps-list by swiping left from the start screen. The merits of an all apps list are obvious, but it’s unfortunate that it’s taken Microsoft this long to implement it. Another big improvement is the changes that Microsoft has made to the search charm. If you’ll recall charms are the five basic meta-options available to user by swiping towards the center of the screen from the right-side or by touching the lower right corner of the screen for mouse-based users. The old search charm had an annoying tendency to tell you that there were no results for a given search term or ignore results from desktop applications, even if you knew that wasn’t true. For example by default using the search charm to find the control panel would only return the start screen control panel and not the desktop control panel. In Windows 8.1 by default the search charm now show those results and checks for matches everywhere on your system. It also offers other related search quires at the bottom of the list to help you zero in on what you’re looking for. This is a big improvement from the functionality of the old search charm, which was useful but often frustrating. The Windows Store was one of my biggest issues with Windows 8. It was an app that made it hard to find other good-quality apps and had poor search functionality. Microsoft seems to have more or less fixed this by simplifying to display the top free and paid apps first. It has also moved category-based app discovery out of the app’s main screen and into a search panel that drops down from the top of the screen when you swipe up. This panel also holds link to a list of all your apps and a link to your account settings. 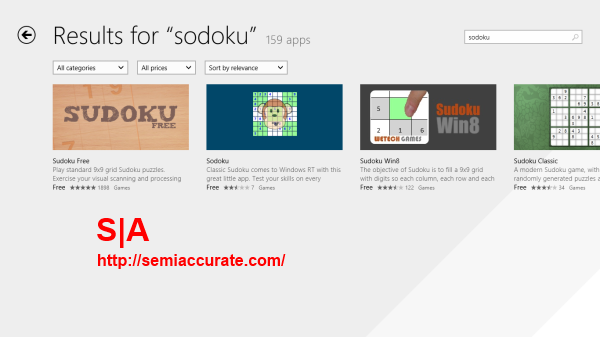 In the piece I wrote about using the Surface RT as my primary computing device last year, I noted that searching for the term, “Sodoku” a common misspelling of the popular game Sudoku yielded no results or suggestions inside of the Windows Store. But in Windows 8.1 searching for this same misspelled term brings up the results for term Sudoku as well as Sodoku. The Windows Store doesn’t try and correct misspelled search terms, it just offers apps with what it believes to be the search term you were looking for. This is an unusual system, but it is no doubt an improvement over the utter silence that this search term engendered last year. The final point I’d like to discus in this article is the app selection inside of the Windows Store. When Windows 8 launched there were not very many official apps in the Windows Store. Of course there were plenty of poorly done knock-off apps, but developer engagement isn’t judged by that metric. Now that the Windows Store has just surpassed 100,000 apps it’s easy to see that there has been a major improvement from last November. At the same time though, Microsoft still doesn’t have a number of important apps and there is still obvious outreach work that the company needs to do. As it stands the Windows Store feels strong, but incomplete and that’s going to be a hard feeling to shake until Microsoft reaches parity with Apple and Google.